With their warm, spicy-sweet flavors, these homemade donuts will disappear from your breakfast table in no time. Chinese 5-spice (a combo of cinnamon, anise, cloves, pepper and fennel) is the star of this simple baked donut recipe. Sprinkle with powdered sugar and enjoy warm, fresh-baked donuts any time! Preheat oven to 350°F. Lightly spray a mini donut pan with cooking spray. In a medium-size bowl, whisk together flour, sugar, baking powder, 5-spice powder and salt. In a separate, medium-size bowl, whisk together remaining ingredients. Add the dry ingredients to the wet and mix well. Fit a pastry bag with round tip and fill with batter. Fill each mold about ⅔ full with batter and bake in preheated oven for 10 to 12 minutes. Donuts will be springy to the touch. Cool in pan for about 5 minutes. Turn out donuts onto cooling rack and repeat baking with remaining dough. 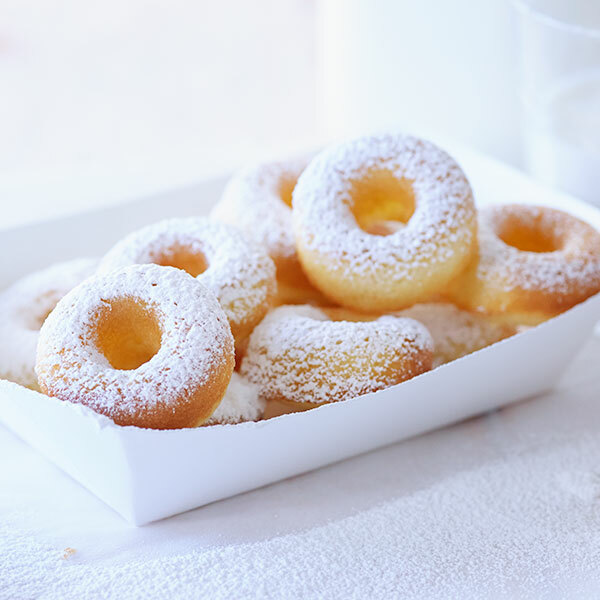 While donuts are still warm, dust with powdered sugar and serve immediately.